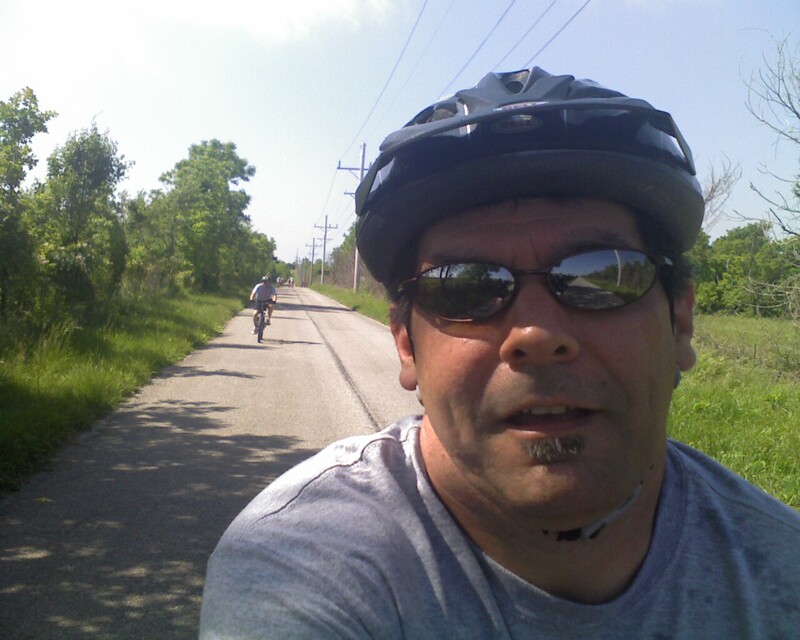 Mike and I rode the Sac River Trail a week ago, but I didn’t post it on the site. Got busy, forgot, whatever…but…here’s the EveryTrail from last week. Rode the 4 different routes that we normally hit out at the Sac River Trail. Unfortunately, after Mike got a flat, I forgot to resume the tracking on the application, so I didn’t get the full distance tracked. Check out the ride here. Still Riding…but slow on updating! It’s been over a month since my last update to the blog. Due to weather and schedules, I think that we have only ridden 2 times since the last post. About 4 weeks ago, Mr Brown and I met up at Willard High School (he was at Rhianon’s cheer leading event) and rode a total of 32 miles on the Frisco Highline Trail. It was HOT, since we had a later start than we normally do on a Saturday ride. I think we started around 10:30 and finished up after 2pm. That was the day of the MS Pancake ride, and as much as I like pancakes, and what the MS Society does, none of my riding buddies could join, so we did the Frisco! 2 Saturdays ago, Mike and I hit the Sac River Trail. It was a great ride, and we rode all 4 of the trails that meet up out back. I think the total is somewhere around 8 miles or so, but I took the cyclometer off of my bike a while back. Skipped riding last week, due to the heat. If the temps continue like they are this morning, there will definitely be a ride at the Sac on Saturday morning, and I am itching to try out using “Every Trail” on my iPhone to track the distance! Ok, I have been getting bad about not blogging rides. Thursday, I got a text from Aaron Wahlquist that basically said he was going riding on Friday AM, 5:15, whether I was coming or not. I showed him!!! I pulled up to his house about 5:15, even after getting a text from him trying to weasel out of the commitment! Had a great ride and a little adventure along the way. Also, a new OFBG Etiquette rule has been added. The person who schedules the early morning ride has to be the leader of the trail, so that they clear the spider webs! Today, Michael Brown and I hit Sac River Trail. We cleared the webs on one path, and while we were trying to decide which direction to leave from where the 4 routes meet, people came from the other 3 directions, and we thanked them for clearing the spider webs for us for the rest of the ride. We rode almost 2 times what we normally ride, until I got a slow leaking flat and had to limp back to the parking lot on the side of the highway again, as we didn’t have time for me to put in a new tube. That mountain biking is addicting!!! Mike and I went out to the Sac River Trail and rode for about an hour and a half. Didn’t necessarily go “fast” but we did ride steady with just a few stops. Kind of changed up the ride by going the opposite direction than we normally do. The trail seems totally different when you ride the opposite direction! I would like to sneak in a ride before the weekend, since I won’t be able to go on Saturday! Met up with Mike, Karrie and Rhianon Brown, and Kasha and Chandler Revie, and rode from the Kearney Street Trail Head up to the Bullseye Store in Willard, and back. The ride was actually pretty nice, in that it was overcast for the most part, and the temp stayed bearable. I hadn’t realized that they had paved as much of the trail as they have, so it really made the ride into Willard very nice. Almost too easy of a ride! I believe the next “Frisco” ride will be from the trail head in Walnut Grove, and we will ride north, over a number of the rail road bridges. Ok…I think it goes like this. Last Saturday morning, Aaron, Mike and I went to Sac River Trail. I rode like a sissy, was worn out way early, and took a huge thorn to the back tire that did a double puncture through the tube. Wouldn’t hold air, so had to push the bike out of the woods. That stinks! Sunday, Kasha finally rode her new to her Townie with me, to meet up with Mike and Karrie, Rhianon and Aly, and we rode to our Sunday night get together at Nathaniel Green Park. The ride to and from was great. Today…Josh, Mike and I took off and hit the Sac River Trail, for Josh’s first off road bike ride. Possibly more of a hike for Josh, but he was a good sport about it. All in all, I had fun, even though I wound up crashing 2 times! The first was a stupid mistake when I was riding too slow and wound up going over the handlebars. The second was taking a turn too fast, hitting some loose rocks and washing out the front end. Up coming ride, Saturday 6/12, 9am, the OFBG is going to ride the Frisco Highline trail, I believe from Kearney St, up to Willard. Some may go further, some may go less, but one thing is for sure…Saturday will be Frisco Highline day! The ride is done! Mike, Mickey and I left my house around 7:15 and got to the St John’s location in Nixa to make sure Mickey could get registered in time before the start of the ride. Prior to the ride, Josh Pautz found us and hung out with us until our ride began at 8am. We also saw Tommy Hawkins, but we missed Ward McMillen and Jeff and Brady Hill. I knew that Mickey had only been on his bike 2 times this year, so a 40 mile ride would be quite a challenge to him. He did great and made it 34 miles (2 miles farther than his longest ride), before the pain in his knee forced him to hitch a ride back to Nixa. I haven’t talked to Ward or Jeff, to see how they did, but we were all proud of Josh for doing the 12 miler. That was about double what he had ridden to that point, and the hills on that ride were pretty tough too! Now, the morning after, my legs are still sore and weak. As much as I would love to hit Sac River after church, there’s no physical way that my legs could handle it today! Unfortunately, we didn’t have our OFBG T-shirts in in time, but we did well as a group and I am glad that we did it. 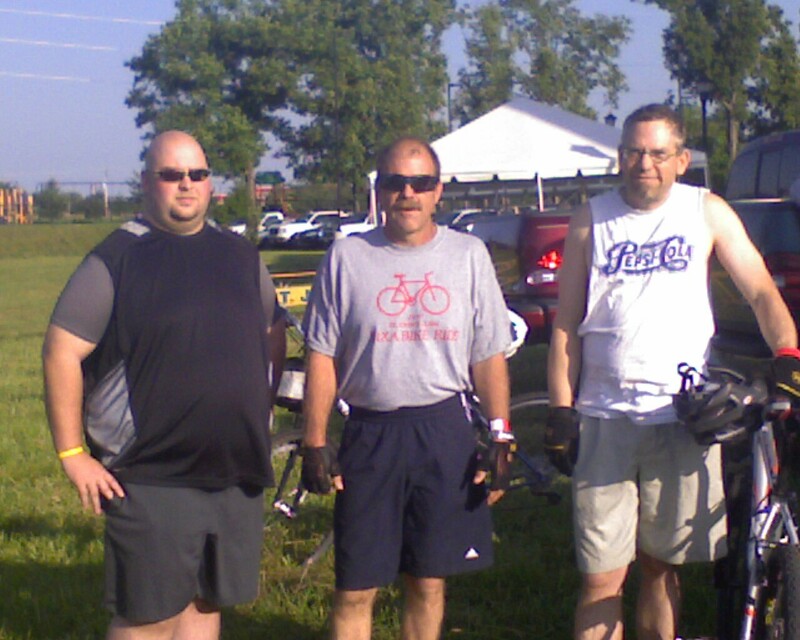 With this weekend’s “St John’s Nixa Bike Ride“, and since Jeff assured us that we were all committing to the 40 mile ride, Mr Brown and I had sent in our paperwork early and bucked up! At this point, it appears that Mr Brown and I are the ones doing the 40 miler. I haven’t heard from Ward, and Mickey forgot to send in his registration. Needless to say, Mike and I have been working on our “training”. 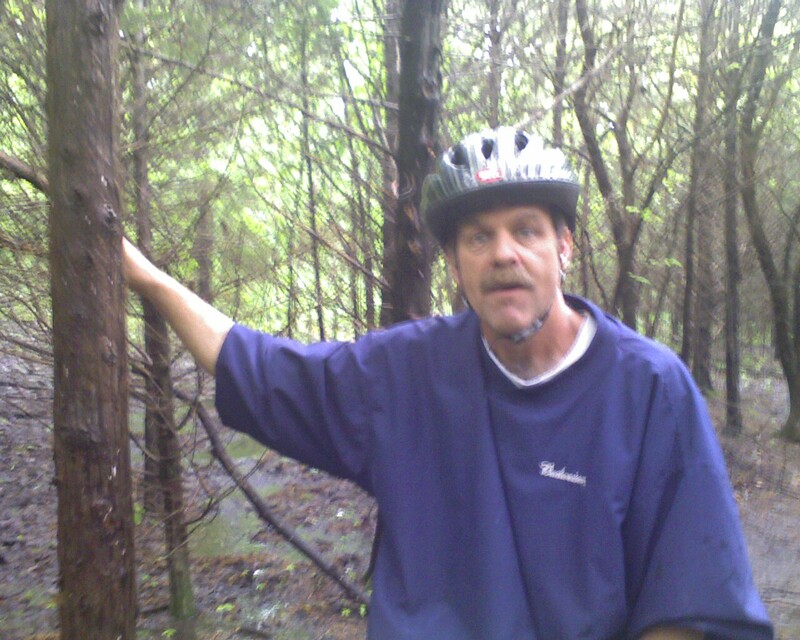 Saturday, 5/15/2010, we went out to Sac River Trail, with Aaron Wahlquist, and rode a few miles in the rain. Don’t know how far we went, as my cyclometer is messed up. We had a total of 3 flats that day. I think Aaron is ready for new tires! The ride was a good time, and I only took a few pics. With that kid seat on the back of his bike, it’s like he’s cruisin’ around in his momma’s station wagon! Cracks me up! 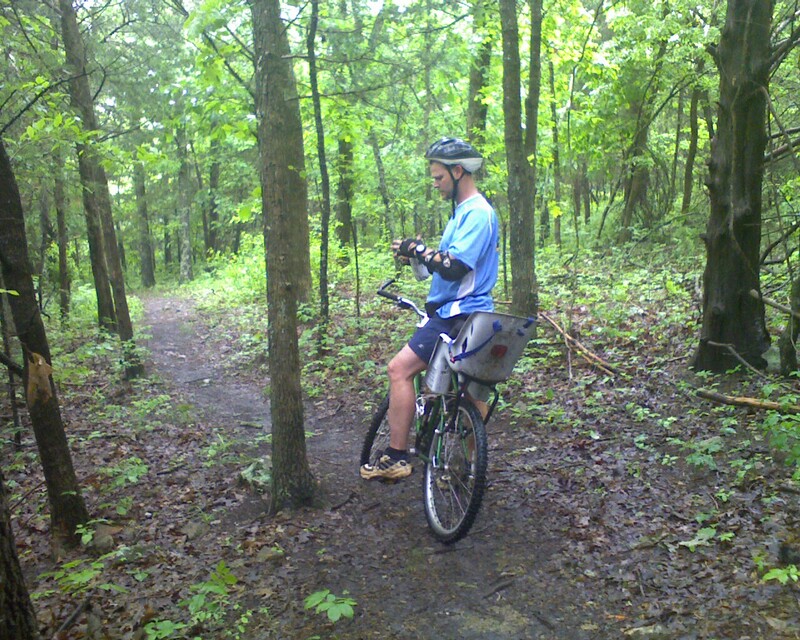 Sunday, 5/16/2010 – Karrie, Mike, Chandler and I rode the South Creek Greenway, starting from our usual spot at Forest Institute, and rode about 8 miles. I think Chandler decided that it was his job to test every puddle and pool of standing water that could be found. I would be surprised if his shoes are dried out by this weekend! Will be doing many more “family friendly” rides like this one. 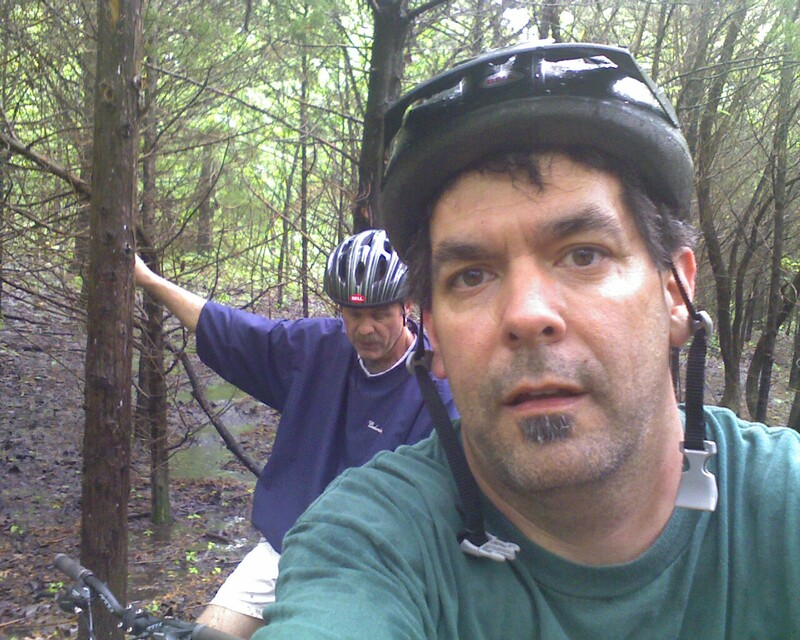 Tonight, 5/18, Mike and I did 2 laps out at Wilson’s Creek Battlefield. Mike had never been there, and since he has an interest in Civil War history, that was a cool thing. Bloody Hill kicked both of our butts the second time around. Since we went before we ate supper, and since we hadn’t eaten since lunch, we were pretty well shot after the second loop. Even though we were spent, we both had a good time riding at the battlefield. I am quite bummed that the forecast has rain thru Monday. Doesn’t look like favorable for bike riding, so Mr Brown and I are looking at building a couple of PVC bike racks for his truck and for my van. Who knows…if there’s a window of opportunity to sneak in a ride between the raindrops, I will do my darndest to let everyone know! UPDATE – Mike and I built our PVC racks Friday night, then tested his on Saturday AM when Mike, Aaron and I went out to Sac River for a soggy ride thru the woods. Mike rode his first successful creek crossing, and we had a good time.